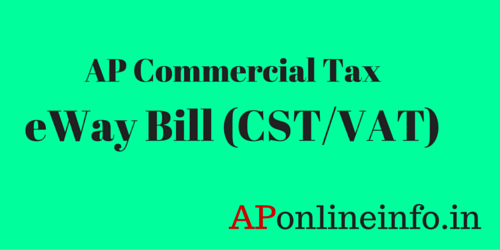 Today i am showing to How to Generating AP Commercial Tax ewaybill ( CST/VAT). AP Commercial Tax Department of Andhra Pradesh has give Opportunity for Dealers can generate their waybills through online and obtain the ewaybill (CST/VAT) easily. AP Commercial Tax Department has providing lot of online services for Andhra pradesh citizens. like as e Payments, eReciept, e Returns, Generate CST waybill, VAT waybill etc. Dealer's should be log on to AP Commercial Tax official website https://www.apct.gov.in/ for obtain the CST Waybill and VAT Waybill through online. if you wants to know How to generate eWaybill, Just follow below instructions for get eWaybill ( CST/VAT ) through online. How To Generate eWaybill (CST/VAT ) through online ? Step by Step Procedure for obtain eWaybills through online. You'll see redirected New Webpage, Here login to Dealer Account With 11 Digit TIN Number and Password. After logged in to Dealer Account, You'll find " eWaybill S/C, F Forms " Option in the Top Menu. Than Click on " CREATE E WAYBILL/C,F FORMS" option. Now You'll see Dealer profile Page, in this Page Select either CST Waybill / VAT Waybill option. that which you want to generate. Than you have to choose either invoice Count less or equal to 5 or Invoice count More than 5 Option. Now you'll see e filling Form, Fill Necessary Details like as 'other Dealer TIN Number, Invoice Number,Value (Rs), Vehicle Number, Quantity etc. Than Click on "Add Invoice - Maximum 5 " Button. Now You'll see the Details of the Waybill, After Verifying Details than Click on "Generate Waybill" Button. Finally Get you "eWaybill (CST/VAT) " online.